The adjustable height bipod from BLACKHAWK! provides a stable shooting platform to ensure that your aim is true. 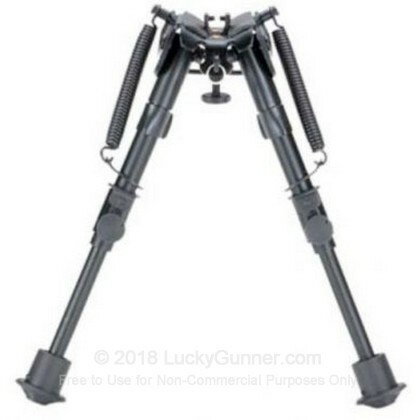 This bipod is lightweight and features adjustable legs that lock into place for a stable shooting position. Attachment is easy on rifles with a sling swivel stud and no tools are required as it attaches to the stud with a simple thumb screw that is included. Fits on my Savage 270 great, only takes a couple of sec's to put on. Good and stable. I bought this for a 308 not knowing if it will work for it but it did and it looks awesome. Easy to put on. The order arrived here within three days of being placed as standard ground, so first let me say that is really great! It took longer to get the bipod out of the package then to get it mounted on the rifle! Fast and simple with no tools needed! Makes it easy to use your same case to carry your rifle and the bipod folds nice and neatly close against the rifle or you can remove it and place it in one of the extra pockets on your rifle case. Very happy with all of the Blackhawk products I have purchased over the years as well as my purchases from Luckygunner.com well impressed with both companies and their quality! I have used this product on the range as well as in the field on hog hunts, pairie dog hunts and when deer season gets here it will be in the stand with me as well! Even if you forget to set the thumb screws the legs have a lock that keeps them in place which I tested to see that it would with stand a day at the range and it passed no issues! Great product for my remington and I have also put it on my other rifles as well from my HMR17, 10/22, 7mm and my SKS and it fits and works on all of them with the same ease! Thanks!!! !